Multiple venues across Brooklyn and Manhattan will open their doors to the Red Bull Music Academy Festival for the month of May. Since settling in NYC in 2013, the RBMA has made it a tradition to celebrate the city’s musical and cultural history through live shows, lectures, beatmaker roundtables, late night parties and this year, a record flea market. Later this week the festival will kick off with an Electronic Africa showcase, with Nozinja, Egyptian synth wizard, Islam Chipsy, and many others, focusing on the country’s musical innovation. Touching on an another musical culture, Kid Millions will explore the diversity of the drums, with a troupe of percussionists within the context of the Brooklyn Museum’s Beaux-Arts Court in 100 Disciplines. The following week, Que Bajo?! will dive into the tropical sounds of the city during Barrioteca Tropical, while later in the month, Sleeping Bag Records will celebrate the intersection of hip-hop and dance music at Go Bang, through a Kurtis Mantronik tribute with Nicky Siano and Morgan Geist, among a few others. The highlight of the month is FKA Twigs’ new two-night live show extravaganza and a conversation with A$AP Rocky. Two out of three of those events are already sold out, but you can still get your hands on FKA Twigs Presents Congregata on May 18th. The heritage portion of the month will bring back to life some of city’s most iconic underground parties like Frankie Bones’ Storm Rave and Venus X’s GHE20GOTH1K, headlined by bounce pioneer, Sissy Nobby. 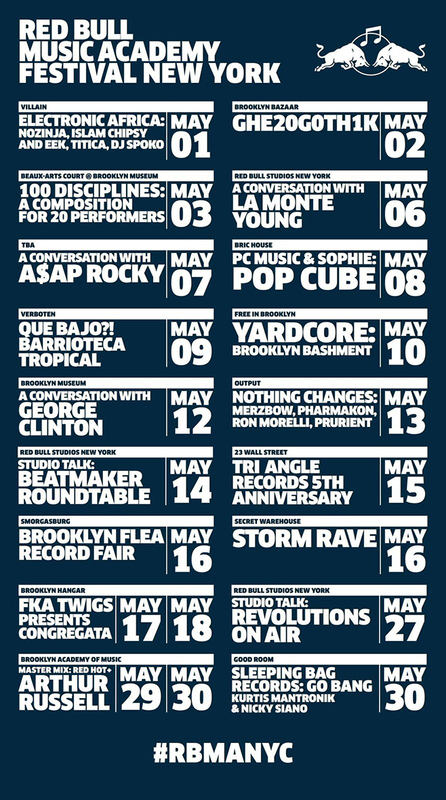 And those are just some of the events the RBMA has organized. Quite frankly, we can’t think of a better way to get up close and personal with New York. The full event list is below, and for tickets and more info head over to nyc.redbullmusicacademy.com.